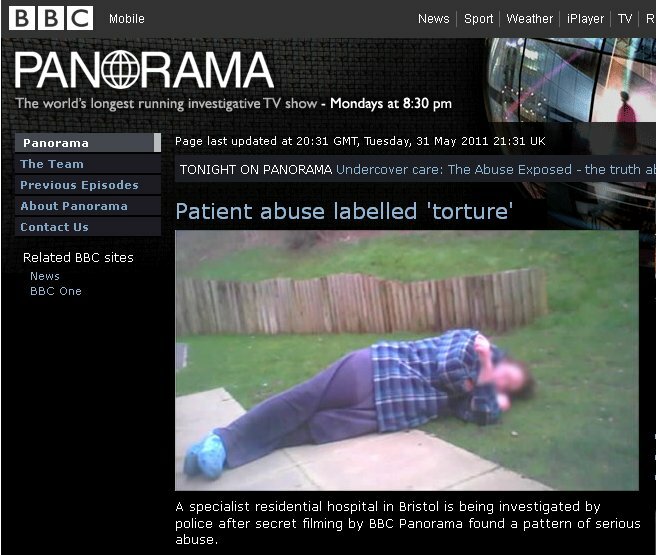 Anybody who didn’t watch Panorama tonight should go and do so on the BBC iPlayer. It’s available here. The programme investigated and exposed serious physical and psychological abuse by carers (including at least one trained nurse) of vulnerable adults with various forms of learning disability. The abuse took place within a private residential hospital in Bristol owned by Castlebeck, a specialist healthcare provider which “…employs 2,100 people, providing care for 580 service users at 56 locations nationwide,” according to Castlebeck’s own statement to Panorama. A former senior nurse who worked in the Unit reported the abuse to managers, but his concerns were ignored. He then reported his concerns to the Care Quality Commission, which is the regulatory body responsible for monitoring and assessing care provided by the NHS, local authorities, private companies and voluntary organisations. As such, the CQC is the body responsible for regulating the Care Homes in which many of our parents are accommodated. The nurse contacted the CQC three times, using the word ‘abuse’, but they too ignored his concerns. When challenged about this by a Panorama reporter, Ian Biggs, a Regional Director of the CQC, described their failure to act as a “misjudgement”, and expressed regret. This is a subject very close to my heart because my elderly father, who suffers from vascular dementia, has been a resident in a number of private EMI (i.e. elderly mentally infirm) care homes, as well as several hospitals, since early 2009. My sister and I have been very concerned on more than one occasion about the quality of ‘care’ that he has experienced, and our attempts to raise serious concerns about an incident which took place when he was a patient on an NHS hospital ward last year met with what felt to us like opposition and avoidance from the bodies we approached. I believe that we should all be very concerned indeed about the behaviour that Panorama has exposed tonight, and in particular the fact that it was allowed to continue unchecked, despite having been raised by a qualified nurse at the highest level, until it was secretly recorded and therefore could no longer be ignored or denied. How on earth can a failure to investigate reports of abuse by a qualified nurse who had worked in the hospital be explained away as a “misjudgement” by the CQC? How on earth could the CQC ever have ‘judged’ it appropriate not to look into such reports? I have no idea, but I find their failure to act quite terrifying, and I hope the issue will be pursued with them. This failure to act three times appears to me to go well beyond some sort of simple administrative oversight or mistake. My father is part of the ‘care’ ‘system’ as I write this, and if you’re reading it then possibly your parent is too, or will be soon. In all likelihood, many of us will end up there ourselves within the not so very distant future. I feel quite sure that what was exposed tonight is simply the tip of an iceberg. I sincerely hope that something is going to be done about it now. An independent judicial investigation into the Care Quality Commission’s failure to act appears to me to be the first necessary step. As I’ve mentioned on here before, my elderly father suffers from vascular dementia and is currently a resident in an EMI (i.e. Elderly Mental Infirm) Care/Nursing Home. The Home is one of many in this country owned by Southern Cross Healthcare. The provision of residential care for elderly people has become big, lucrative business these days, especially with the rise in the number of elderly people suffering from dementia. My father and I are fortunate in that he has granted to me a Lasting Power of Attorney for Health & Welfare, the effect of which is that I am entitled to make decisions on behalf of my father that he no longer has the capacity to make for himself, in respect of matters that relate to his health and welfare. Elderly people who haven’t granted such an LPA to their relatives or friends can be at a major disadvantage in being dealt with by social services and healthcare officials, some of whom have become used to being able to make important decisions without involving relatives. See here for a post I wrote some time ago in relation to LPAs. The Care Plan, BTW, is a basic document which actually forms part of the contract betweeen the resident and the Home. I already have a copy, and it’s not a large document. £50 for a copy of a short document that forms part of the contract between my father and the organisation he pays a significant monthly sum to in respect of his care? Well, as I mentioned above: the provision of residential care for elderly people has become big, lucrative business these days, especially with the rise in the number of elderly people suffering from dementia. 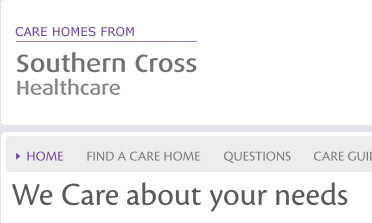 Southern Cross Healthcare is the name of the organisation in question. If at some stage you find yourself choosing a Care Home for your own elderly and vulnerable relative then it might be worth bearing that in mind. Great news here. 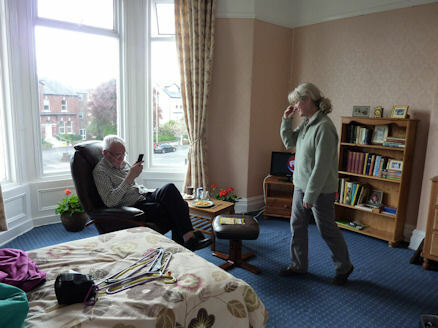 My sister and I moved our father to a new Care Home last Saturday. There was one ‘incident’ too many at the place he’s been in, and we decided we had to move him again. It’s not a decision we made casually, as apparently 1/3 of residents who move from one CH to another die within 12 months. The great news is that Daddy seems to have settled into the new place, and almost immediately! It’s 100s of times better, and nicer, than the last place–because Daddy’s mobile now we had many more options than a year ago, when he couldn’t walk without falling due to the cocktail of toxic drugs the hospital had put him on, to keep him quiet on the ward–and although at first he refused to go in he eventually agreed to take a look at his room after a brilliant care assistant spent 2 hours with my sister and me, gradually gaining Daddy’s trust. He loves the food, and some of the staff. We’ve been able to take him out for a walk, and he went back in without a murmur. He’s had two conversations with one of the other male residents, and even in the course of 48 hours my sister and I both feel that his speech has improved discernably. I’m hoping that this is the beginning of the end of the daily nightmare that began in January last year, when Daddy decided to get on a train and present himself at the local hospital. It looks like we’ve finally found a place that really *can* be a home, where Daddy can make friends and feel secure, and we can trust the staff to take real care of him when we’re not present. You are currently browsing the archives for the Dementia care category.